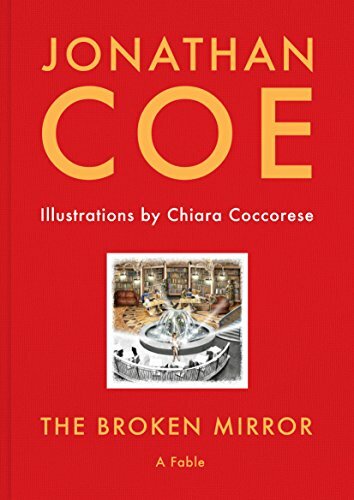 The Broken Mirror is a fable ostensibly for children, but I suspect most readers will actually be adults, to whom Jonathan Coe is best known as a writer of darkly humorous literary novels. This particular book was published in Italian in 2012 but this is the first time it's been available in English. It's a collaboration with Italian artist Chiara Coccorese, who has provided the illustrations. Eight-year-old Claire finds a piece of broken mirror at her local rubbish tip, and discovers that it reflects the world not as it really is, but how she subconsciously wants it to be. At first, she sees fantastical images of magic castles and her favourite toy becomes a real tiger who sleeps cuddled up to her on he bed. As she grows older the mirror's reflections become more realistic, but still represent something a little better than reality. As she enters her teenage years she looks in the mirror less and less, but returns to it when political developments begin to have a negative impact not just on her own family, but on the whole town. It's a simple story but one that addresses some fairly complex ideas and, as in a lot of Jonathan Coe's novels for adults, there's clearly a strong message about the current state of the nation and how we might improve it. Despite the simplicity of this 96-page story, Claire is a realistically flawed character - initially disdainful of a kind but nerdy classmate, for example, and losing touch with her best friend upon leaving primary school. And although this story was originally written in 2012, there are certainly some moments which seem all too plausible in light of the Brexit referendum. There are parts of this story which are terribly sad, but it ends on a note of hope and the overall message is a positive and progressive one. As a book for children, I'm not sure what age group it would appeal to; at under 100 pages it's a very short and simple read, although Claire is a teenager for most of the story. But as an adult I enjoyed this as a quick and beautifully written read. It's published by Unbound, which is of interest in itself - Unbound is a crowdfunding publisher which asks patrons to pledge a contribution to help finance the publication of the book. Contributions can can vary and what you'll receive depends on what you pledge - in this case, starting from a limited edition copy, but some pledges would buy you a invitation to the launch party, for instance. This helps to finance a wider print run so copies can be made available for anyone else to buy. I was one of the patrons of this particular project - which gives you an idea of how small a contribution can be to make a difference; I think I pledged £20 to get a limited edition, numbered copy with my name in the list of patrons printed at the start. I would definitely contribute again to a project I really cared about. It's a nice way to support authors whose work you really value to be able to publish books that might not be otherwise commercially viable.